With the so-called constructivist turn in the social sciences, the relevance of ideational elements for (the construction of) social reality has been increasingly acknowledged. In political science, ideas and norms were always a concern, but never became central until this turn that started out around 1990 (Finnemore and Sikkink 1998: 890). So, it is rather a return to traditional positions and research interests than a mere turn, but with the decisive difference that ideational factors (such as ideas, norms, frames, paradigms, identities etc.) are viewed as the most pivotal ingredients for political results - at least by constructivists themselves (ibid. 888). Rationalists apparently reject these assumptions by labeling interests and according rational behavior as the most crucial elements for political outcomes. Thus, in International Relations Theory, “[t]he opposition of constructivist and ‘rationalist’ arguments that has become widespread […] implies that the issues constructivists study (norms, identities) are not rational and, similarly, that ‘rationalists’ cannot or do not treat norms or identities in their research programs” (Finnemore and Sikkink 1998: 909). The approach in International Relations Theory that could be labeled as mostly materialistic is classical realism. It suggests that "states respond to material needs, incentives, and power" (Hurd 2010: 299). Therefore, materialists hold that ideas do not construct and structure social reality, but only reflect the material world and serve to justify material causes (Adler 1997: 324). In other words, materialism is ‘the brute hardware approach,’ since only material factors are directly relevant for political outcomes. Rationalism, in contrast, could be characterized as the essence of both Neo- Realism and Neo-Liberalism - or what has been called the ‘Neo-Neo-Synthesis.’ Hurd (ibid.) also labels rationalism as “instrumentalism,” since it follows the ‘logic of consequentialism,’ within which actors instrumentalize political means to achieve maximal utility in pursuing their goals. Thus, from this perspective, "states pursue individual advantage by calculating costs and benefits" (ibid.). Constructivism rejects materialism, positing that the materialist position is untenable, since it only focuses on material power and hardware. 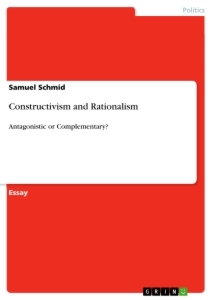 However, constructivism holds that rationalism is not all wrong - it is simply incomplete. Hence, a constructivist would introduce ‘political software’ such as ideas and norms, which are attached to material objects or social practices and give meaning to them. Hurd (ibid.) thus speaks of the "social and relational construction of what states are and what they want" with the underlying ‘logic of appropriateness’ that tells actors how to behave according to what is socially considered appropriate. Yet, the debate between constructivism and the rationalist mainstream has more been about which logic is valid or even existent rather than how they may complement each other (Finnemore and Sikkink 1998: 913). 1 It must be kept in mind that I do not consider basic ontological and epistemological questions. In this respect, the theories can differ greatly (e.g. constructivist holism vs. rationalist individualism). The thesis discussed in this essay is therefore limited in that regard. Furthermore, no concrete example is shown (see Hurd 2010 for such an example). The International System. To what extent is anarchy a constant or a variable?